By Paul Bennett, Western Sales Manager, and Karim Dehkordi, Director Global Customer Support & Services Acculogic Ltd. Since the mid 1990s, moving probe in-circuit test systems have been widely used for electronic structural testing of prototypes and new product introduction of printed circuit board assemblies (PCBAs). For higher-volume and faster production testing, in-circuit test (ICT) or manufacturing defect analyzer (MDA) systems, using a bed-of-nails (BON) test fixture, have been the choice for production testing of printed circuit boards (PCBs) and printed circuit board assemblies (PCBAs). An increase in number of individually programmable flying probes from 4 to 22. Double sided probe access to Board under Test. Probes programmable in angle from 0° to ±6° in all directions. An increase in the speed and accuracy of the mechanical movements of the flying probes and shuttles. The addition of fixed channels for continuous access to high usage nets. reduced test time and increased test coverage. Elimination of redundant tests when multiple test tools are available. Event-driven test software for verification of process changes. Incorporation of a flying BON fixture or mini BON fixture. Inclusion of application-specific probe tips. The results in these advances in technology include higher test coverage, shorter test times, and higher yield at the next stage in the manufacturing process, such as full functional test. Testing PCBAs has never been routine and has spurred the development of a number of different test-and-measurement applications. For example, test systems based on In-Circuit test (ICT) technology or manufacturing defects analyzer (MDA) technology, have employed BON test fixtures to contact each individual net on a PCBA, typically using one test probe per net. In these test systems, a relay matrix typically switches the ICT electronics to the combination of nets needed to test each component or connection. In terms of speed and volume, ICT test systems can keep pace with the highest-volume production lines; they are limited primarily by the physical size of the contact point and adjacent center-to-center distances that test probes must cross on the PCBA. For each unique PCBA type to be tested, a different BON fixture is needed, adding cost and time delays to the ICT approach. In addition, a growing number of PCBAs simply cannot be tested with BON testers because of little or no test probe access on the nets, or because potential test points are too close to each other. Timing is also critical with the ICT approach, Investment in a BON fixture too early in the process can result in having to make expensive and time consuming modifications to the BON if engineering changes to the PCBA design render the original test fixture obsolete. Investment in a BON fixture too late in the process may mean that the fixture is barely used before production ends. Typical costs for fabricating ICT fixtures are $5,000 to $20,000 per PCBA part number. It is not unusual for a test fixture to cost $60,000 or more for a large PCBA. The Flying Scorpion testers embody numerous advances compared to the legacy approaches to PCB and PCBA testing. Perhaps the most basic improvement offered by these testers has been in the increase in available flying probes. The number of flying probes has increased from 4 on a single-sided system or 8 on a double-sided system to as many as 22 probes on a system. The increased number of moving probes on both sides of a PCBA reduces test time and increases test (fault-location) coverage. A single test program can now test all PCBA components in a single pass. Test time on flying probe systems is also dependent on the time required to move the probes from one position to the next, and the greater number of probes in these newer systems results in shorter test times. To decrease test time even further, the motors on the Flying Scorpion systems that control the up and down movement of the probes have been updated with the latest technologies, resulting in a 50 percent decrease in mechanical movement time of the probes. There is also no sacrifice in probe placement accuracy as a result of this added speed. With rated ±0.5um probe placement accuracy, the Flying Scorpion system can reliably place probes on 4-mil pads 99.99 percent of the time as the result of the integrated design of fiducial cameras, shuttles, and the advanced probe system. The Flying Scorpion system includes fixed channels for some chores, which can help add to measurement speed. Analysis of any moving probe test program will show that a few nets, such as power and ground, are contacted hundreds, if not thousands, of times during the execution of a single PCBA test program. This means that a considerable amount of time is lost contacting these few nets in a repetitive manner. The addition of fixed channel (nonflying) contacts to access these nets can significantly reduce the total test time. For increased fault coverage and reduced test time, the Flying Scorpion system incorporates a boundary scan controller in conjunction with its flying probes. Depending on the number of components on a PCBA that can be tested with boundary scan methods, the PCBA test time may be reduced by 50 percent or more compared to measurements without the boundary scan controller. When a Flying Scorpion system with boundary scan capability is used, the removal of redundant tests is automated. Using "event-driven" software, a Flying Scorpion system can be incorporated directly into a production line, with a beat rate in the tens of seconds. This test mode provides complete measurement of all components on a PCBA to start. After a sufficient number of PCBAs have been tested, the test mode is switched to test only the devices whose setup has been changed in the manufacturing line. For example, if a feeder has been changed for a resistor, testing of that resistor on all PCBAs would be enabled to verify that the feeder change is correct. This "event-driven" testing then allows the ICT test for the subject resistor to be turned off. This assumes that components that have been verified and components without any changes will continue to pass after initial testing is performed - again, reducing test times to near ICT speeds. 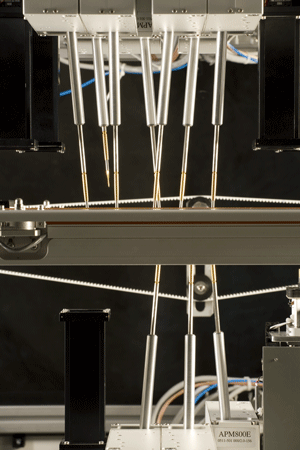 The Flying Scorpion system features a patented Mini-Flying BON fixture with as many as 128 unmultiplexed test channels. This miniature version of an ICT test fixture can be placed anywhere on a PCBA under test. The Mini-Flying structure of this fixture allows for large reductions in test time and, therefore, higher-speed production volume testing. This novel approach provides an increase in test productivity that can otherwise only be achieved by ICT methods, but at a fraction of the cost and implementation time of traditional ICT approaches. For some smaller products built in panelized formats, the Flying BON fixture has provided 100 percent of the required test coverage. For test flexibility and adaptability, the probes angles on the Flying Scorpion are not fixed, but are programmable in angles from 0° to ±6° in all directions, which can dramatically increase test access and, therefore, PCBA fault coverage. Most flying probers can only use a sharp needle-like probe tip when contacting a PCBA under test. The miniature tip size enables probing of very small test points that may be physically close together. For production testing, different probe tips that compensate for different products and manufacturing methods may be a more appropriate choice. With the capability to handle as many as 22 flying probes, a Flying Scorpion system enables the use of application-specific probe tips such as chisel, rounded, or even flat that can be mixed in any combination for a custom solution. The use of these different probe tips provides for testing similar to an ICT system. The Flying Scorpion test system provides a great deal of PCBA measurement capability that can speed board evaluations without sacrificing accuracy. It can serve both prototype and production test requirements, providing maximum flexibility for electronics PCB and PCBA manufacturers.